Coveted, warm 550-fill down insulated jacket stays true to classic mountain styling with high-loft baffles protected by a DWR (durable water repellent) finish. 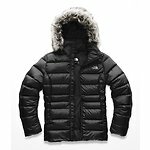 An elastic-shaped waist and removable faux-fur trim at the hood give this warm insulated jacket a touch of style to go with its outstanding performance. Very comfortable and warm without being bulky. It looks equally good in active pursuits or as a fashion item. Love it.